Hortus Camdenensis | Coreopsis tinctoria Nutt. Fully hardy erect annual, bearing solitary, bright yellow flower heads, shading to brown red at the bases. Darker colour variants are available. In early Victorian gardens the darker flowered forms, in shades of scarlet purple, edged with yellow, were often known as Calliopsis bicolor. To 1.2m. [RHSE, Hortus]. ‘Native of the whole of the Arkansas territory, as far as the Red River, North America, where it was discovered by Professor Nuttall, during his travels in that country. […] Communicated by Mr. Anderson from the Chelsea garden, in September 1823.’ [BM t.2512/1824]. Several forms were recognised in victorian gardens. The Floricultural Cabinet figures Calliopsis tinctoria var. atropurpurea, with rich purple-crimson flowers with yellow-edged petals, ‘it far exceeds in beauty the common kind.’ [FC p.96/1836]. ‘The centre [of the flower] is yellow, surrounded by a circle of dark purple, beyond which, to the extremities of the petals, is of a fine red scarlet colour. It is a splendid flowering annual, and deserves a place in every flower garden.’ [FC p.235/1836]. ‘The flowers [of Calliopsis bicolor atrosanguinea] are liable to vary, some being entirely of that fine deep blood colour, which composes the centre of the old C. bicolor (Coreopsis tinctoria), and others have a very narrow margin of rich yellow.’ [MB p.243/1835]. BM t.3511/1836. 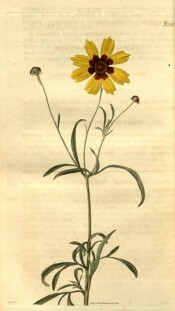 Listed as Calliopsis bicolor [H.34/1843] and Coreopsis tinctoria [H.83/1843] in all published catalogues. As garden forms are quite variable in colour we can assume that there were distinct differences between the plants identified as Coreopsis tinctoria and Calliopsis bicolor. 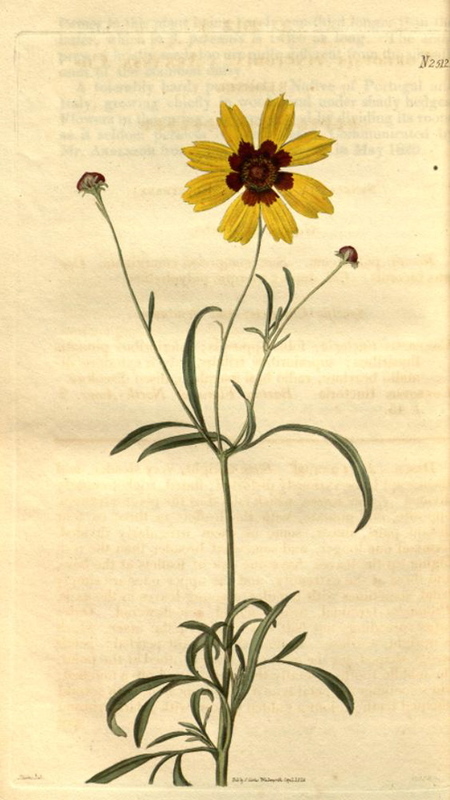 From the description of Calliopsis bicolor atrosanguinea given in Paxton’s Magazine of Botany it would seem that the ‘centre of the old C. bicolor (Coreopsis tinctoria)’ was a ‘fine deep blood colour’ and the rest of the flower ‘rich yellow’. [MB p.243/1835].